What is an Australasian parrot doing in a 15th century Italian painting? The Sulphur-crested Cockatoo is a species of parrot native to Australia and eastern Indonesia. 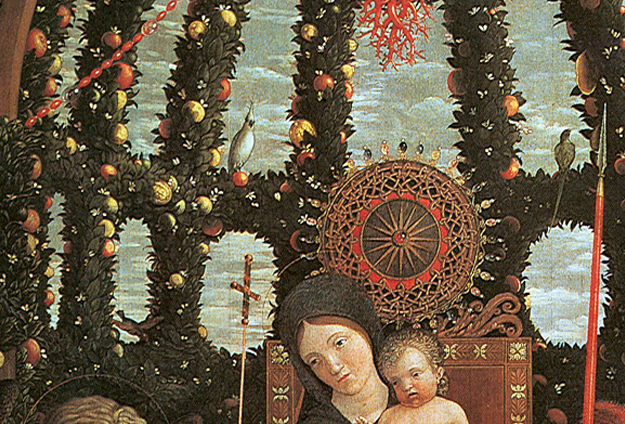 However, you can also see one in the Madonna della Vittoria, a painting made in 1496 by Andrea Mantegna. The identification of the bird was made by University of Melbourne scholar Dr Heather Dalton. In an upcoming article from the journal Renaissance Studies, she suggests that animal was sent by trade routes from eastern Asia to the courts of 15th century Italy. The Madonna della Vittoria was commissioned by Francesco II Gonzaga, Marquess of Mantua, and depicts Francesco paying homage to Mary, who sits on a throne and holds the baby Jesus. The painting can now be found in the Louvre. “The presence of a Sulphur-crested Cockatoo in a European painting of 1496 suggests that there were complex and far-ranging South-East Asian trading networks in our region prior to the arrival of Europeans,” Dalton adds. Click here to access her article ‘A Sulphur-crested Cockatoo in fifteenth-century Mantua: rethinking symbols of sanctity and patterns of trade’ from Renaissance Studies. See also: A Kangaroo in a 16th century manuscript?